The funeral home tells me that no services were planned and no full online obituary is available, but I did find a Pan Am newsletter article from the year 2015 noting Captain Brissette’s 100th birthday and his life story...please see below. 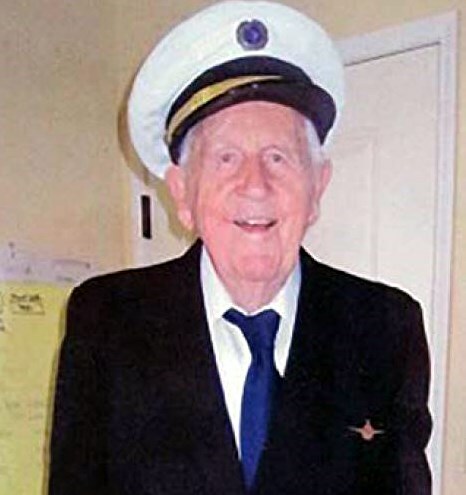 September 29, 2015 marks the 100th birthday of Captain Leslie C. Brissette. Always sunny and optimistic, Les has a funny rejoinder ready for any question or quip. He goes armed with a pocket full of jokes to keep any crowd laughing -- whether it’s the churchgoing ladies or the bridge playing guys. He’s the toast of the dining room at the Vi at La Jolla where he moved about 5 years ago. Who can resist the charm of a Sky God bearing bottles of carefully curated wine to dinner? Great way to make friends! Born and brought up on a farm in Saranac, New York, Les declares that he “didn’t see much future in farming and it sure wasn’t paying” so he took a temporary Civil Service job with the 1940 census. With WWII on the horizon, the government set up seven “free” flight training schools around the country and Les was assigned to what he refers as “Parkersburg, West-By-God Virginia” and started training on the UPF 7. “Very maneuverable” he recalls. Then he transferred to Northeastern’s flight school in Burlington Vermont where PAA came recruiting. Next stop, 4th officer on the Flying Boats out of Miami (where he claims his job was sorting US Mail) , then the Boats out of La Guardia to Lisbon. Back to Miami, on to Panama and then to the IGS. Like many of the IGS pioneers he and his family started out living in England but ultimately moved to Berlin where he retired in 1975. Then, Les and his wife Lilo began a new career of adventures. It included 270,000 miles in a mo-bile home, residences around the country and a ranch in Colorado before they settled down in the San Diego area favored by many of the pioneer pilot crew. He stays in regular touch with a number of the old PAA gang in-cluding Dewy Hoffman, John Bell, Bill Box, Bill Nash, Richie Stewart, Clipper Pilot Les Brissette Celebrates 100th BirthdayBy Pat MacKaywidow of Charlie Stewart, and Gudy Barnholt, widow of Barney Barnholt. Pat MacKay, daughter of Clipper Pilot Tom MacKay, has known Les since her first trip to Berlin in 1958. Tom and Les first met during WWII in a layover barracks on the Africa routes and always stayed close. Tom went on to follow Les to Panama and then to Berlin. Tom retired flying the 747s out of LAX in 1980. Wife Lilo obituary...............BRISSETTE, LILO C.
Lilo C. Brissette, born on October 15, 1926, died on July 3, 2010, after a long illness. Born in Koln, Germany, she immigrated with her parents to Canada; back to Germany at the beginning of World War II. She worked as Hospital Secretary with the American military in Wiesbaden. Took a tour of East Berlin where we met, dated and married in Woking, England, over 53 years ago. ...............He headed west about Sunset on Sunday evening...we were all lucky to have had such a wonderful man in our lives. One month shy of his 103rd birthday! The last of the Greatest Generation.